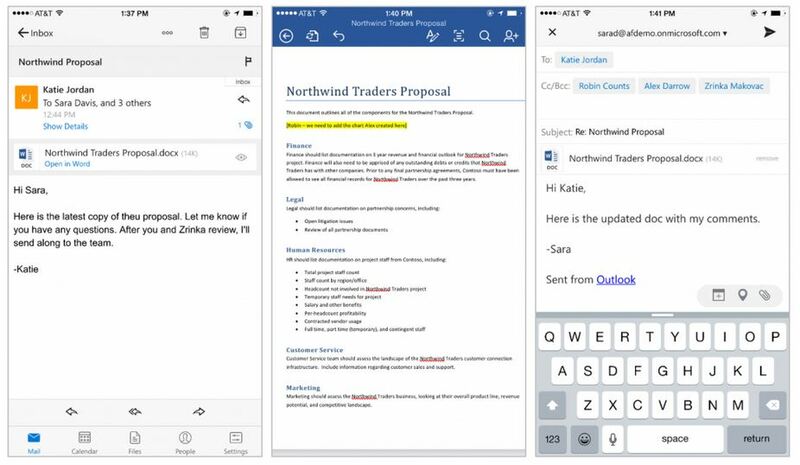 Today, we are excited to announce deeper integration between Outlook and our other key Office apps for iPhone and iPad—Word, Excel and PowerPoint—designed to make it easier than ever to collaborate on and share Office documents on the go. In many organizations, Word, Excel and PowerPoint documents capture the bulk of the knowledge and experiences that information workers produce—strategy documents, sales presentations, contracts, market analyses, etc. In our personal lives, these documents contain to-do lists, travel itineraries, monthly budgets and more. This information is then frequently shared with others in email using Outlook. 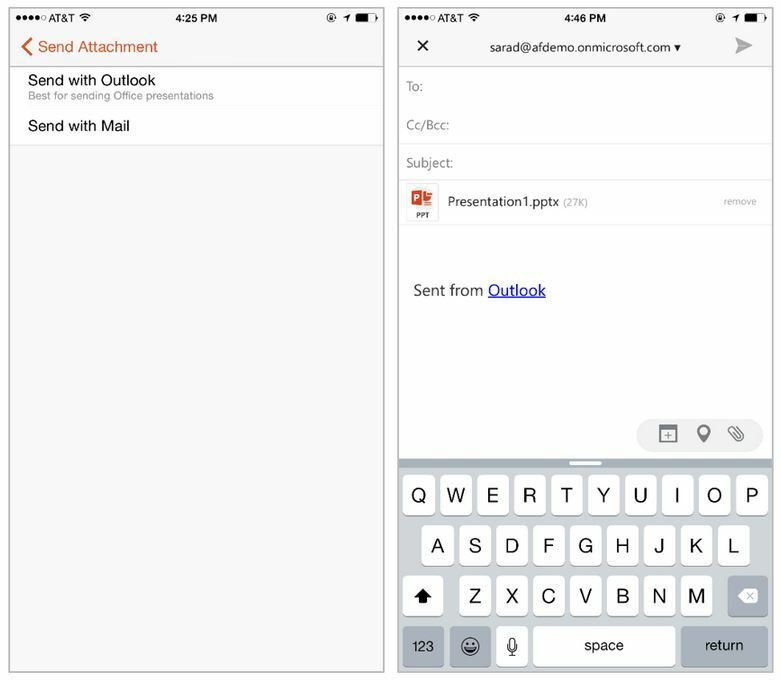 Outlook for iOS now opens Office documents sent as attachments directly in their respective apps, replacing the simple viewers we previously used. We’ve also streamlined the steps required to collaborate on files sent as attachments. These updates, combined with Outlook’s Focused Inbox, tight integration with calendar, customizable swipe gestures and predictive search help you get more done, even on the smallest screen. Let’s take a look at these new features. Editing Office documents sent as attachments is now quick and simple. Tapping on an attachment in Outlook will open the file directly in Word, Excel or PowerPoint, ready for editing in the richest and most powerful authoring apps for iOS. If you haven’t yet downloaded the Office apps, Outlook will load a built-in viewer and provide a link to download the app in the App Store. You can tell which apps are installed by noting the Open in <app name> text underneath the title of the attachment. The Open in Word text indicates Outlook will open the file directly in Word. If an Office app is not installed, Outlook opens the file in a simple viewer and provides a link to the App Store. A common scenario for many is collaborating on attachments and sending edits in email. To date, this activity was almost exclusively done at a computer, due to the many manual and sometimes confusing steps necessary when using the built-in Mail app for iOS. Outlook and the other Office apps make this process a breeze. With the latest updates, once you’ve opened a file from Outlook and finished making your changes, a single tap on the Back button closes the document and returns you to Outlook, automatically adding the now-updated file as an attachment in your reply. Editing and sharing Office documents doesn’t always start from your inbox. While the best experience for collaborating on a document with others is to save and share the file from OneDrive, sometimes an attachment is necessary. Word, Excel and PowerPoint now include a “Send with Outlook” option in the “Share” menu. This button will bring up the Outlook “Compose New Email” pane with the document attached and ready to share. Together, Word, Excel, PowerPoint and Outlook for iOS bring together the core tools you need to get things done, even on the smallest screen. Download the Office apps for iPhone and iPad for free today and let us know what you think of our latest updates. The teams are always hard at work making improvements, and we want your feedback to make Outlook better! Please share your comments within Outlook by going to Settings > Suggest a Feature. Q. Is this capability available for Office for Windows and Android? A. Office for Windows has had rich integration between Outlook and Word, Excel and PowerPoint documents for decades. We expect this capability to be available on Android in the next couple of months. Q. 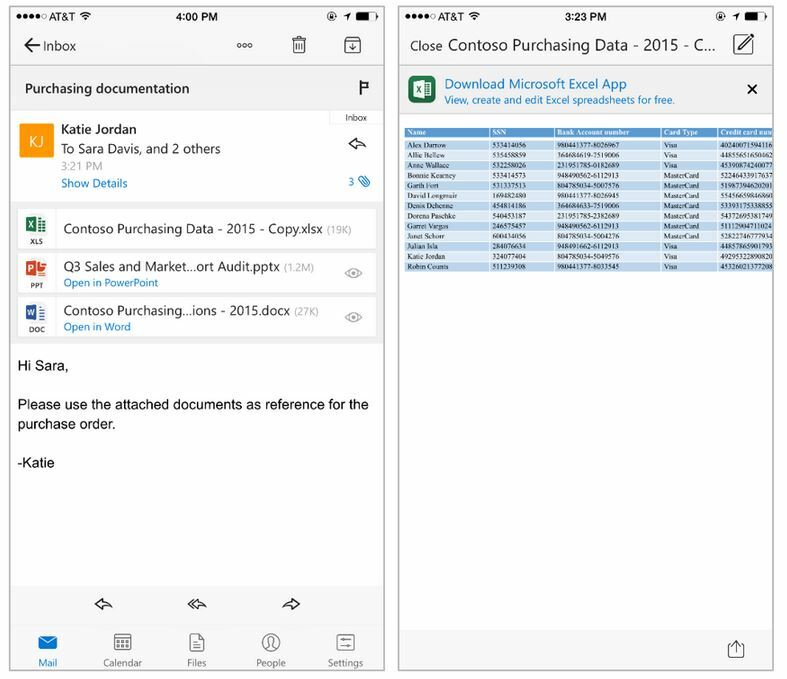 When is OneDrive for Business support coming to Outlook for iOS? A. Outlook for iOS connects to OneDrive, Dropbox, iCloud, Google Drive and Box. We will be updating Outlook for iOS to connect to OneDrive for Business later this year.